Today, LED signs can be found in most municipalities. The power to advertise efficiently, effectively, and professionally has prompted many businesses to forgo traditional advertising media in order to go digital. The reasons to use digital signage are obvious and easy to understand, but buying a digital sign isn’t something a business owner should do without consulting a professional. 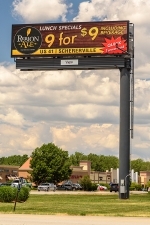 It can be a challenge to obtain a digital billboard permit for an ideal location that reaches areas with high traffic volume. Working with your local municipality can be easier if you follow these key tips. To maximize their branding and advertising impact, many businesses have been replacing manual reader board signs with newer digital models. There are dozens of solid reasons to do this, but the main factors are cost efficiency and time. Watchfire is proud of our history of service and we know that LED signage and software service solutions need to be available at a moment’s notice. That’s why we make it as easy as possible for you by making valuable service information available to you 24/7 in our online KnowledgeBase. Local businesses and big advertisers use digital signage differently, and use different terminology to describe their signage. The way digital displays are permitted, where they are located, and the type of content they display are just some of the differences between these two sign types. © 2019 Watchfire Signs, LLC. All Rights Reserved.